If you work in a hospital, clinic, or anywhere else in medical care, you likely wear the beloved wardrobe of scrubs everyday. Scrubs are a great uniform because they are comfortable, convenient, simple, and easy to clean. Despite their popularity and usefulness, scrubs weren't always the uniform in hospitals. After reading about the history of scrubs, where they are today, and the most common colors, buy new scrubs for your job, or just your daily life, and check out online stores for scrubs in Tulsa, OK.
Before the invention of scrubs, medical professionals like surgeons and physicians would usually work in street clothes, and nurses would wear specialized dresses. Medical scrubs were first used in the twentieth century in a move to become more sanitary in surgery, and soon expanded to other hospital personnel like physicians, nurses, and radiologists. At first all scrubs were white in order to promote cleanliness. However, the white scrubs with the white operating rooms in combination with the bright lights all lead to eyestrain. They then started making scrubs in other colors, like blue, green, and pink. Scrubs now usually consist of a short sleeve V-neck and draw string pants, though there are jackets, caps, and long sleeves available. The material scrubs are made out of varies from cotton, to polyester, to a polyester and cotton blend. There are even scrubs made out of blends with spandex or rayon, though these are not as common. You can now also get scrubs in almost any color or pattern you want. For instance, you can get scrubs with polka dots, with hearts, dog bones, or even your favorite cartoon characters. Though you can get scrubs in almost any color imaginable, there are things to consider when choosing a color for you. Certain colors, like red, can seem too intense and can remind patients of blood. The color white is hard to keep clean, and therefore is impractical in a field where stains are common. Scrubs that are khaki or orange may look too much like a prison uniform, instead of a medical professional. The most common colors for scrubs are common for a reason. They look nice, are flattering on many, and are easy to clean. 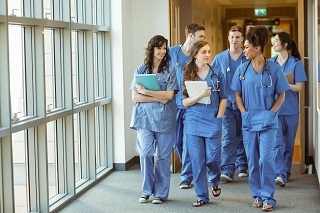 Some of the most popular colors for scrubs include black, because they are professional and flattering, turquoise or teal, because they are uplifting colors and help you stay cool while working, and navy because it is a strong color that easily hides common stains. Hunter green, grey, royal blue, and purple are also all common colors, as well as various shades of pink and brown. These colors are all simple enough where they wont shock or distract other personnel or patients, but unique enough to add a little spice to the hospital environment. Bright colors like pinks and purples can cheer up those around you, while more neutral colors like browns and greys can create a calming feeling. If you want a color in between try the popular ciel blue, which is cheerful without being intimidating and looks good on just about everyone. Wearing common colors will help your workplace feel like one big team. Get scrubs in Tulsa conveniently today by visiting online stores like raleyscrubs.com.